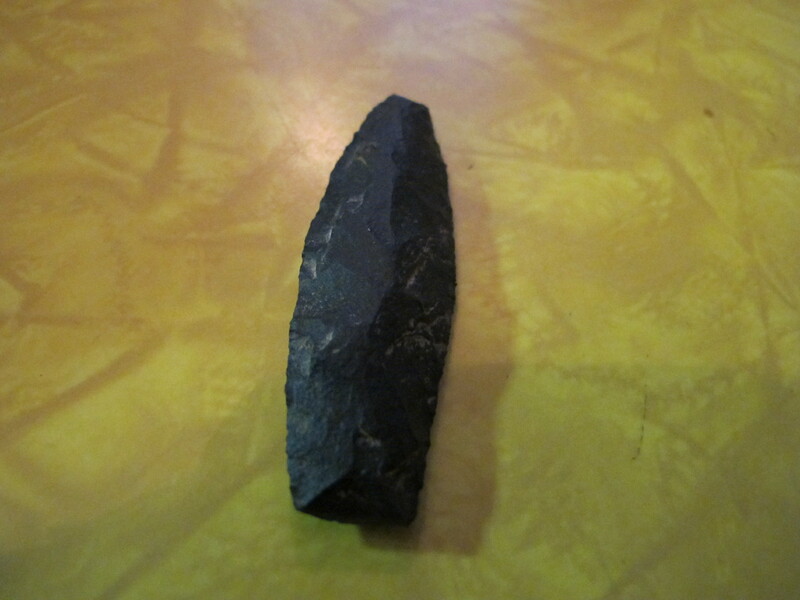 Found just outside my doorway in the muddy pit where I was laying bricks for a patio, this projectile point sent ripples of excitement to Seattle and back. I made my most “significant” archaeological find when I was leveling the earth in front of my porch to set some bricks for a walkway. I came across a stone…not that uncommon…but this one was a peculiar shape. It was flat and sharp-edged. Most of the rocks I was unearthing had been rounded by glacial or riverine action, basically the gravel from an old road. For some reason I set this one aside and later I took it to the sink in the bathroom to sluice the mud off of it. I was floored by what I found: a beautiful palm-sized projectile point. 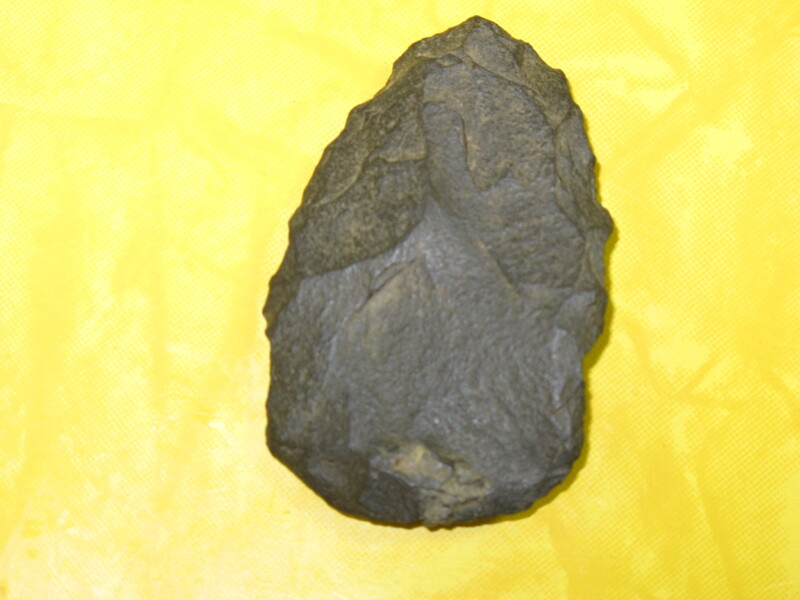 When I was young in the Lower Crab Creek valley of Eastern Washington it was almost a sign of status to have discovered what we called an arrowhead. My older brothers had all found them and it was frustrating that no matter how many hikes I took, no matter how vigilant I was, with my eyes scanning the crust of the the desert soil, I never received what seemed to be that secret blessing from the past. Maybe they’d all been used up. Then came the hot summer day when my father, blanketed in yellow dust, came home for lunch after spending the morning rototilling a new field he was opening up. He reached into the pocket of his overalls and dropped a red arrowhead on the kitchen table. When he had stopped work to come home he noticed the point lying on the fender of his tractor a few inches from his side. The rototiller had hurled the artifact at him. Hunting “arrowheads” was considered appropriate and respectable in those days, even though the federal government had laws on the books to prevent artifact plundering since 1906. People spent weekends with their families systematically sweeping likely areas for relics that frost or winter rains had exposed. Others even camped out at known encampment sites, digging trenches and screening the soil for the treasures lost or abandoned by people long, long ago. Emory Strong’s Stone Age on the Columbia River and Norma Seaman’s Indian Relics of the Pacific Northwest sat on bookshelves or rode on the dashboard of family station wagons. A few famous collectors like these authors provided the core of the displays in several northwest museums. But locally prominent collectors also accumulated extensive hoards of relics. Today recently illegally-gathered items are sold or auctioned off pretending to be part of those older collections. Over the decades laws have been strengthened and there have been prosecutions of people who continue to dig for Native American artifacts. The message seems to have gotten through to most reasonable people: digging destroys our limited archaeological resources. Still, there are some whose ethics don’t extend past the profit. Ironically, I only started finding arrowheads after I learned of strict federal statutes prohibiting the gathering of artifacts on federal land. I remember visiting the trail head at the top of Red Rock Canyon, stepping out of my car and into the sagebrush only a few paces from the graveled parking lot. There by my left foot lay a creamy white arrowhead. You can imagine the devil on one shoulder and the angel on the other as my conscience debated whether to take it. I left it, knowing that the next person to find it would probably not leave it where it lay. The same thing happened on a visit to my grandfather’s homestead a few years later: I happened across a beautiful bird point, broken vertically. Only one half of the point lay on the sand. I imagined that the spirit world had the other half. Until the day I uncovered that muddy rock in front of my house, the only point I’d ever discovered that I was entitled to take home with me was the most unique find my family seemed to have encountered. It was a slim black basalt willow-leaf point, beautifully sculpted and almost perfect. I picked it up in the sagebrush on the upper edge of the family farm and I remember plunging the metal heart of my click pen into the soil where I found the point in case anyone ever had to know exactly where it came from. I began researching the style of this relic, which was a cumbersome task in the days before internet. Eventually I decided that my find most closely matched the point that archaeologists called “Cascade points,” dating from before 7,000 years ago. The black basalt Cascade point I discovered on the family farm near Taunton inspires students in my fifth grade classroom with an appreciation for the past. Decades later I pulled the tissue-wrapped relic out of the box I’d stored it in and passed it around my fifth grade classroom for the students to hold and feel. We were studying human migration in Social Studies and I had been describing how Washington looked after the Ice Age. The tale of my Cascade point and the people who must have made it enthralled the class in a way that I don’t think they’d ever have experienced if they shuffled past the same relic on display in a museum. Can you imagine the thrill I felt that day I discovered the broad spear point in front of my own home outside of Bellingham? Since moving there, I had missed the open spaces Eastern Washington had provided. Dense shrubs and ferns conceal the surface of the earth in Western Washington, even if the towering cedars, firs and hemlocks have been removed. Unlike in the deserts in Eastern Washington where even casual visitors might leave historical clues, evidence of people who once lived in Western Washington lies concealed beneath dense layers of duff and humus. I had to share my excitement, and I knew just who to call. One of my close friends had connections with paleontologists at the Burke Museum. When I told him about my discovery, he hastily planned a visit. It was he who told me that I had a “significant find.” He borrowed the point, telling me as I left that the archaeologists were likely to want to dig trenches in front of my porch. I assured him that they could do that. A few days later he called me back. He had taken the point to the Seattle museum and shown it to his paleontologist friend. The reaction was rather less than either of us had expected. Briefly peering at the point through a jeweler’s loupe, the paleontologist suddenly glared at my buddy and said, “What are you trying to pull?” It turns out my find was a resin copy of a Clovis point. My wife can’t explain who might have dropped it in our driveway. Nonetheless, the Clovis point copy also excites my students as I explain how earlier generations used this sort of thing to kill mammoths. This entry was posted in Anthropology, Archaeology, Archaeology, Bellingham, Columbia Basin, Crab Creek, Education, Family History, Hiking, History, Native Americans, Science, Washington and tagged Anthropology, Arrowheads, Artifacts, Auctions, Bellingham, Books, Burke Museum, Cascade Point, Cedar, Central Washington, Clovis, Collections, Crab Creek, Desert, Eastern Washington, Emory Strong, Family, Family History, Farming, Federal. Relic Hunting, Fir, Hemlock, History, Homestead, Ice Age, Mammoths, Migration, Museums, Native Americans, Norma Seaman, Paleontologist, Red Rock Canyon, Sagebrush, Seattle, Social Studies, Spirits, Students, Teaching, Tractor, Washington, Washington State, Western Washington. Bookmark the permalink. Too brittle, I think. It can’t be very old, since it’s a synthetic petroleum-based goo. I remember dad taking us up on “steamboat” rock in the crab creek area close to Lawrences place (or on it, can’t quite recall.) I picked up my first knapped scraper there. It seems there was a lot of detrius from a knapping area there. The story was that it provided a high ground with a view all around so it was safe to sit for hours and make tools there. I still have two large frames of Arrow heads/points that my grandfather Meugniot picked up while herding sheep in the area. When I acquired them after my parents died, I remounted them as the frames were giving out and the points were sliding drastically in the cases. There are probably twol hundred or more of them. The are only the perfect points as Gradfather had mounted them for display a a county fair in the late teens or early twentys. I can say that I never did find a whole poin but did find several good quality hide scrapers and quite a few bits. I also have acouple of war clubs and on really good net weight.